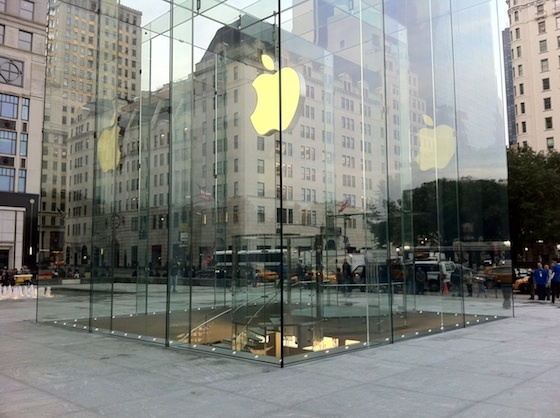 While Apple's Fifth Avenue retail store in Manhattan is not set to reopen until 10:00 AM this morning, crews have completed their work on the revamped glass cube, fully revealing the streamlined design for the first time. MacRumors reader Vincent sent along these photos of the new cube, which utilizes only 15 panes of glass rather than the 90 used in the original cube. The new cube is also "seamless", doing away with nearly all of the hardware that previously held the panes of glass together. In addition to the new cube, Apple has also upgraded the plaza, refreshing or installing new water drains and pavers while removing the small bollards that had previously surrounded the cube. Update: YouTube user patjem2 has posted a brief video showing the new cube and a growing crowd of customers just prior to the store's reopening. A second video also shows the first customers entering the newly-reopened store through the updated glass cube. oh wow it looks so.... oh wait, it looks exactly the same. Wow, a new glass cube slightly different than the previous glass cube. Not exacly front page news if you ask me. Transparent aluminum as described in Star Trek 4. Off course we can..there are way more people walking around in this picture. All you people saying $6m, SOOOOO much money, SUCH a waste of money, better things could have been done with it...really? Hmmm, how about all the jobs that work created? How about all the tax revenue, both state and federal, parts of which went to welfare, schools oh and yeah MEDICAL RESEARCH. Sure, not alot of it, a percentage of a percentage, but still something. And then how about all the jobs the income of those workers, the state and federal tax money went on to create, the money they spent in other industries, from the bagle the workers had for breakfast and associated salaries for those workers and MORE tax money all the way down the line. Oh and I love the people who blame Tim Cook for this, like he approved it, this redesign was planned well before him. Oh and $6m is NOTHING, people who think it is, really need to stop looking at things from your income POV and look at the project as a whole, what was done, what things cost today and the fact that it was done on 5th freaking Ave in NYC. That $6m went a LONG way in THIS economy, much further than any single charity could have done to help pepole who need jobs, esepecially in the construction industry. I haven't even mentioned the tourist dollars and additional sales tax revenue it will generate for the city, state and federal govts all of which in part goes to support the research and charities, yes a small percentage, but still support. And when you add it all up, the jobs, the income tax, the community spending, the tourists, the sales tax down the road and more, that $6m spent will return more than that to the economy than just handing $6m cash to some charity. What a waste of millions of dollars. 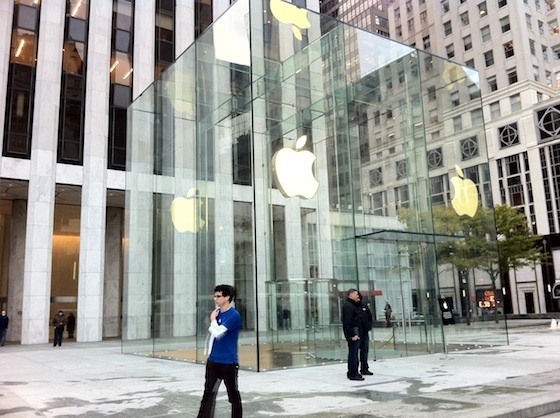 It's not like the design change of the glass structure is going to impact customer numbers flocking to the store. Yeah, what a waste to pay people to do a job. Lets not encourage this too much, because there are already enough jobs to go around.